This is a friendship quilt where my dear friends in my Thursday group quilting group made blocks for me. I designed the iris block and insisted each iris be a different color. Most of my friends were already pretty pissed off because I had the nerve to pick a hand-applique block versus a simple nine patch block. 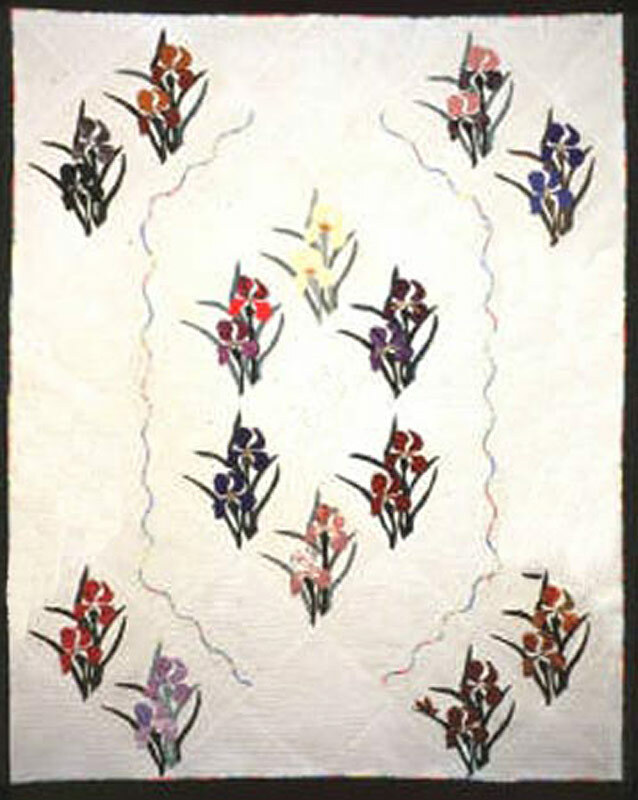 Thus, the actual name of the quilt is: A Bouquet of Belly Aching Beauties by my Thursday Friends. My dear friend, Denise Burrough’s (Good) did an amazing needlepoint label for this quilt. I will cherish the quilt forever. The hand-quilting is so dense, it took me a year to hand-quilt it. The center iris is stuffed and beaded.